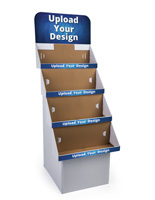 Cardboard POP displays are a must-have for many retailers! These convenient point-of-purchase stands are notorious for increasing the sale of slow-selling merchandise. 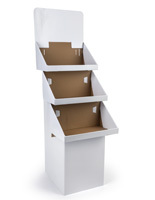 The cardboard POP displays, also known as floor racks, move items off over-stuffed shelves where they can be easily overlooked, and bring them front and center in an impossible-to-miss corrugated bin. 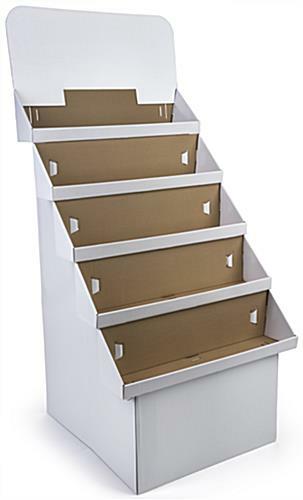 They are ideal for holding a wide variety of items in many different locations! 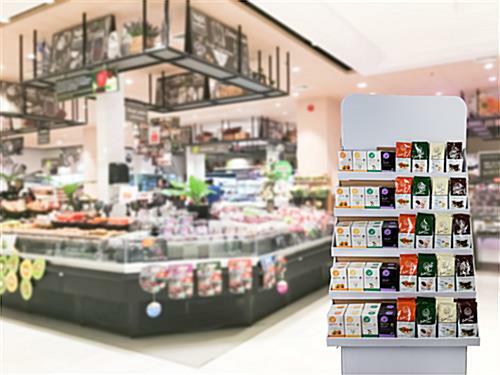 A retail store uses the cardboard POP displays to draw attention to health and beauty items, tissue paper, DVDs or CDs. A grocery store is a very popular place to see a point of purchase merchandiser. 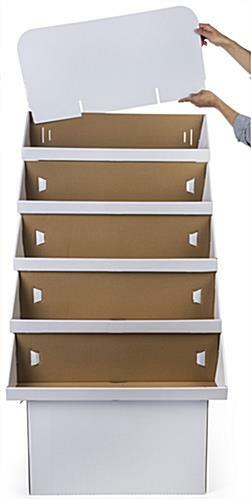 They are often filled with boxes of foodstuffs, like crackers, cereals or pastas. The cardboard POP displays could also showcase seasonal items like Easter or Halloween candy or gifts. Place them near a checkout counter for almost-guaranteed higher sale numbers! Kids love to rifle through the cardboard POP displays for candy and other goodies! 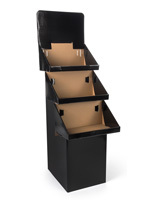 The possibilities are endless with these corrugated stands. 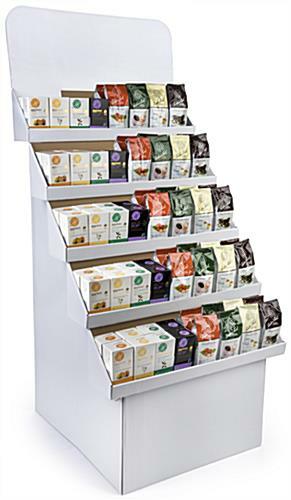 These floor racks, cardboard POP displays are designed to fit into virtually any budget! 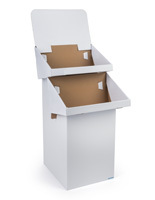 They are built from corrugated paper, at a much more reasonable price than point-of-purchase sale bins crafted from wire! 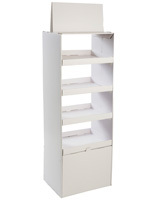 The cardboard POP displays have 5 individual areas for displaying goods. 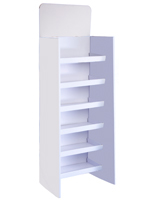 This is helpful if showcasing different brands or product lines in one floor rack is important. The stacked arrangement of the sale bins takes up little room on the floor, allowing more items to be displayed in a store! 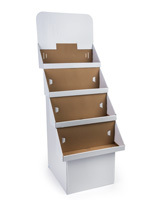 Each compartment measures 30" wide by 7-1/2" high by 6"deep. 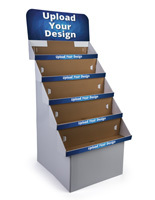 The optional header allows users to display signage atop the point of purchase sale bins, as well. 30.0" x 66.5" x 29.0"
30.0" x 7.5" x 6.0"
The Cardboard Display works perfect for me. I set up a kiosk at local craft fairs and bazaars to sell my journals and journal covers. Before, I laid them on the tables and they weren't noticed much. As soon as I put them in the Cardboard Display, many people noticed my product and sales increased. I am very pleased with it. It is light and easy to move. It is easy to put together and take apart. This is the perfect review in our opinion, Amy! We LOVE hearing that our products are able to help your brand and product stand out. Empowering people to make an impression is what we're all about :) Thank you for sharing your kind words and we wish you tons of future success! GREAT PRODUCT. BETTER THAN EXPECTED QUALITY. GOOD SOLID CARDBOARD. NOT FLIMSY AT ALL. HOLDS PLENTY OF DVDS. 49-50 REGULAR DVDS PER TIER MORE IF YOU HAVE BLUE-RAYS. EASY ASSEMBLY FITS TOGETHER PRETTY WELL ONLY 30" WIDE FITS MY PURPOSES JUST FINE. I WILL BE ORDERING ANOTHER ONE WHEN THEY ARE BACK IN STOCK. GREAT BUY FOR THE MONEY SPENT!! Thank you for the rave review, Chet! We're so glad you'll be shopping with us again! Posted one year ago by JULIE T.